Editor’s note: This is one in a series of stories leading up to Concordia University Wisconsin’s spring graduation ceremonies. Check back tomorrow for more stories celebrating some of CUW’s unique graduates and/or programs. There was a time when Susan Perkins didn’t know if her daughter, Rachel “Rach” Hoffman, would be able to attend a college, let alone graduate from one. Rach, 22, of Grafton, definitely desired it, said Perkins. Almost all of her high school friends went on to attend some sort of post-secondary institution and Rach, too, wanted to experience the joys and freedoms of living in a dorm room, joining collegiate clubs, attending classes and hanging out on campus, to name a few. For Rach, however, there were some unique challenges that made the scenario questionable. Although never officially diagnosed as cognitively disabled, Rach scored low on certain cognitive and developmental tests throughout her schooling, and her parents weren’t sure if she could handle the rigor of post-secondary academics. 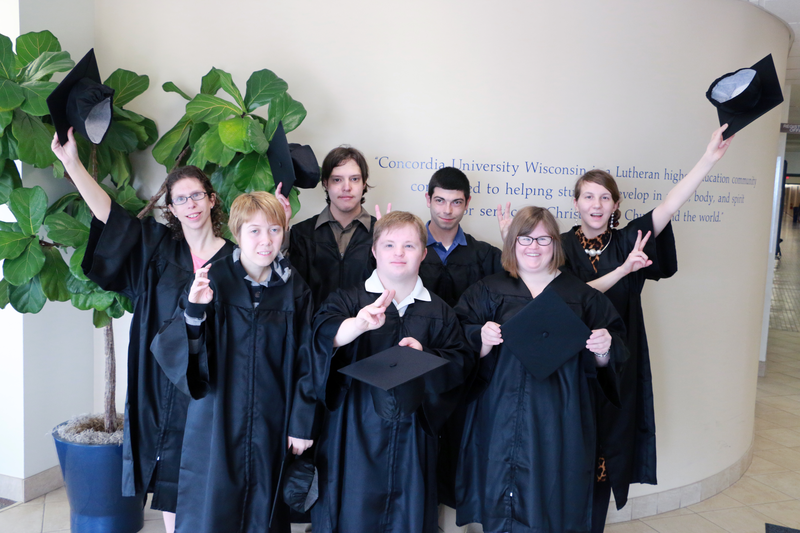 However, when Concordia University Wisconsin, in partnership with Bethesda Lutheran Communities, began Bethesda College—a unique, two-year program designed specifically for students with developmental disabilities—the family saw a promising opportunity. Two years later, Rach and six others from the college will cross the CUW graduation stage to receive a Certificate of Applied Learning, marking the first crop of Bethesda College graduates. The students will graduate alongside Concordia’s more than 540 undergraduates on Saturday, May 14, at 1:30 p.m. on the University’s Mequon campus. Through Bethesda College, a unique, two-year program catered specifically for students with cognitive and developmental disabilities, students live on the CUW campus in integrated residence halls and have opportunity to attend classes that blend a liberal arts focus with skills development. The curriculum is designed to help students grow intellectually, vocationally, socially, personally and spiritually, while also giving them some of the perks of a typical university-level experience. It is the only post-secondary program in Wisconsin that blends the best practices of a nationwide service provider for people with developmental disabilities with the learning environment and resources of an accredited university. The non-profit Bethesda Lutheran Communities was founded more than 110 years ago by Lutherans who wanted to connect their hearts of faith with hands of service by helping people with intellectual and developmental disabilities. Bethesda’s goal, like CUW’s, is to foster the mission and ministry of The Lutheran Church-Missouri Synod. In addition to Rach, those graduating on Saturday from the program will include Christopher Brandt (Milwaukee), Claire Chalupka (Whitefish Bay), Kristen Van Handel (Mequon), Mary Cate Neff (River Hills), Thomas Scandrett (Mequon) and Alec Shafer (Fox Point). Perkins says she’s seen tremendous growth in her daughter over the past two years. Through the program, Rach has had opportunity to intern at Newcastle Place Retirement Community in the Memory Care Unit and at Crossroads Presbyterian Preschool in the 3-year-old program. Although Rach hasn’t yet lined up a job for after graduation, Perkins says the two experiences have given her daughter direction and affirmed her value in those settings. For more information, contact Carol Burns, director of Bethesda College, at 847-224-0637 or carol.burns@cuw.edu. Additional information can be found at http://bethesda-college.org.